There is evidence that Milosevic was assassinated. He was poisoned in The Hague prison (managed under the auspices of the UN Tribunal). There was no investigation into the underlying causes of his death. Eleven years after his death, a second trial chamber at the UN War Crimes Tribunal in The Hague has concluded that Slobodan Milosevic was not responsible for war crimes committed in Bosnia and Herzegovina. More than eleven years after his death, a second trial chamber at the UN War Crimes Tribunal in The Hague has concluded that former Serbian president Slobodan Milosevic was not responsible for war crimes committed in Bosnia where the worst atrocities associated with the break-up of Yugoslavia took place. Buried in a footnote deep in the fourth volume of the judgment against Bosnian-Serb General Ratko Mladic the judges unanimously conclude that “The evidence received by the trial chamber did not show that Slobodan Milosevic, Jovica Stanisic, Franko Simatovic, Zeljko Raznatovic, or Vojislav Seselj participated in the realization of the common criminal objective” to establish an ethnically-homogeneous Bosnian-Serb entity through the commission of crimes alleged in the indictment. This is an important admission because practically the entire Western press corps and virtually every political leader in every Western country has spent the last 25 years telling us that Slobodan Milosevic was a genocidal monster cut from the same cloth as Adolf Hitler. We were told that he was the “Butcher of the Balkans,” but there was never any evidence to support those accusations. We were lied to in order to justify economic sanctions and NATO military aggression against the people of Serbia – just like they lied to us to justify the Iraq war. This is the second successive trial chamber at the International Criminal Tribunal for the Former Yugoslavia (ICTY) to conclude that Slobodan Milosevic was not guilty of the most serious crimes he was accused of. Last year, the Radovan Karadzic trial chamber also concluded that “the Chamber is not satisfied that there was sufficient evidence presented in this case to find that Slobodan Milosevic agreed with the common plan” to permanently remove Bosnian Muslims and Bosnian Croats from Bosnian Serb claimed territory. The Tribunal has done nothing to publicize these findings despite the fact that Slobodan Milosevic was accused of 66 counts of genocide, war crimes, and crimes against humanity by the Tribunal. 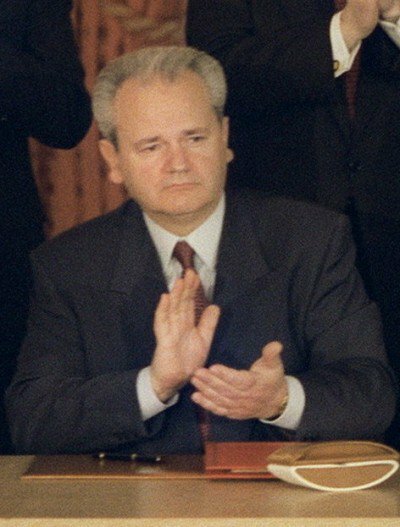 Milosevic died in the Tribunal’s custody before the conclusion of his own trial. He was found dead in his cell after suffering a heart attack in the UN Detention Unit two weeks after the Tribunal denied his request for provisional release so that he could have heart surgery that would have saved his life. Less than 72 hours before his death, Milosevic’s lawyer delivered a letter to the Russian Ministry of Foreign Affairs in which Milosevic expressed fear that he was being poisoned. There are no Dutch legal provisions that prohibit a doctor from telling a patient the result of their own blood test, and U.S. diplomatic cables published by Wikileaks show that the Tribunal had zero regard for medical confidentiality laws when they gave detailed information about Slobodan Milosevic’s health and medical records to personnel at the US embassy in The Hague without his consent. Milosevic’s trial had been going badly for the prosecution. It was glaringly obvious to any fair-minded observer that he was innocent of the crimes he was accused of. James Bissett, Canada’s former ambassador to Yugoslavia, said Milosevic’s trial “had taken on all the characteristics of a Stalinist show trial.” George Kenny, who manned the U.S. State Department’s Yugoslavia desk, also denounced the Milosevic trial proceedings as “inherently unfair, amounting to little more than a political show trial”. Milosevic’s supporters, on the other hand, were emphatic. They wanted the live broadcasts to continue because they knew he was innocent and they wanted the public to see that for themselves. Slobodan Milosevic’s exoneration, by the same Tribunal that killed him eleven years ago, is cold comfort for the people of Serbia. The Serbian people endured years of economic sanctions and a NATO bombing campaign against their country because of the unfounded allegations against their president. Although the Tribunal eventually admitted that it didn’t have evidence against Slobodan Milosevic, its disreputable behavior should make you think twice before accepting any of its other findings.